eLibrary on the Guided Research application now offers integration with Microsoft OneDrive. Note the MS logo login link on the landing page directly to the left of the Google Login link. This allows users to authenticate to the Microsoft API. eLibrary subscription includes access to eLibrary on the Guided Research application and on the ProQuest platform. 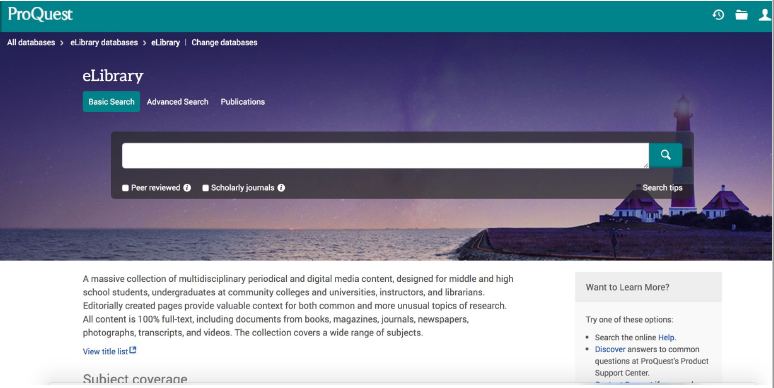 The eLibrary® database has been completely re-imagined, with a redesigned experience that more efficiently guides novice researchers to identify their research topic and find authoritative information to support their research claim. Presented on the award-winning ProQuest platform, eLibrary offers two methods of access: a custom Guided Research application, and as part of the unified platform, assuring fit-for-purpose use. The responsively-designed user interface offers access on any device at any time. and, users can cross-search eLibrary with other ProQuest databases, improving your library’s return-on-investment. eLibrary®—the user-friendly general reference tool—delivers one of the largest general reference collections of periodical and digital media content designed to support every range of users, including middle and high school students, college-prep and college-level researchers, and professional educators. Educators can even search for resources that correlate to state and national standards, including Common Core State Standards. eLibrary’s updated interface and features make research easy. Researchers will find the answers they need from more than 2,090 full-text magazines, newspapers, books, and transcript titles, plus a collection of over 7 million maps, pictures, weblinks, and audio/video files. Editor‐created Research Topics give content, context and pathways beginning users need to start researching a topic. With eLibrary’s Research Topics, users can review the best (and most visually attractive) content, curated by editors, on more that 11,000 of the most popular search queries. A great starting point to learn the context behind the topic before exploring the article results. In the new eLibrary, editorially-curated content is easier to find. The browse experience is highly visual and intuitive, and the product will display well on a range of devices. The search experience is dramatically better with primary and scholarly sources easier to find. Users may cross-search eLibrary with other ProQuest products.